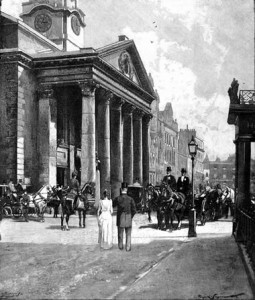 The parishes of Christ Church and St George, Hanover Square, included the greatest and most characteristic part of Mayfair. Not all who lived in these parishes were rich, but the inhabitants included, together with their households, many of the wealthiest people in London. The district took its name from the fair which was held there every May until the middle of the 18th century, on ground now covered by a part of Curzon and Hertford Streets. 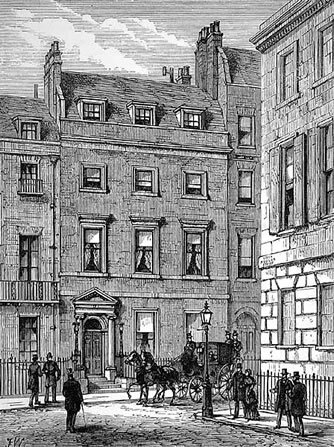 At its heart lay Grosvenor Street, which was surrounded by splendid houses. Despite the introduction of gas lighting in the early 1800s, the aristocratic square long resisted its intrusion, and still has much fine ironwork for the holding of its lamps and the extinguishing of its torches. Here, the eldest houses date from the early years of the eighteenth century, many of whom have hardly been touched since they were built two hundred years ago. Mayfair was actually only a very small district, its boundaries being Piccadilly on the south, Oxford Street on the north, Bond Street on the east, and Park Lane on the west. 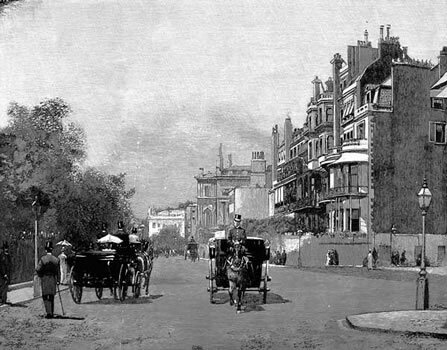 However, in that small area bordered by four major London streets resided many of Society’s brightest and most famous: Apsley House at Hyde Park Corner; Gloucester House and the gorgeous palace, Devonshire House along Piccadilly; while Park Lane boasted Londonderry House, Dorchester House, Dudley House and Grosvenor House; and Berkeley Square, considered the “darkest square in London,” was adjacent to Lansdowne House. Of the smaller streets within the district, none was so famous as Curzon Street. It was here where the infamous Reverend Alexander Keith joined in matrimony as many as six thousand couples a year in a little chapel of his own with a church porch close to Curzon Chapel. Among those that took advantage of Keith’s Chapel was James, 4th Duke of Hamilton, and the younger of the beautiful Miss Gunnings. Keith later died in the Fleet prison, and Curzon Chapel was demolished in the 1900s to make way for a townhouse built for the 9th Duchess of Marlborough. At its east end Curzon Street narrowed to a passage between the gardens of Devonshire House and Lansdowne House which took the foot passenger into Berkeley Street. This passage was closed by a set of vertical iron bars on either end after a highwayman in the late 18th century, whilst escaping from a successful coup in Piccadilly, evaded his pursuers by dashing down the steps and along this passage. It was in No 19 Curzon Street where Benjamin Disraeli died in 1881. On Bolton Street lived Fanny Burney at No 12. Emma, Lady Hamilton and the celebrated actor Edmund Kean both resided in Clarges Street; Prince Lieven, the husband of one of Almack’s patronesses and also Russian Ambassador, resided at No 30 Dover Street. To the south of Piccadilly lay St. James’s. 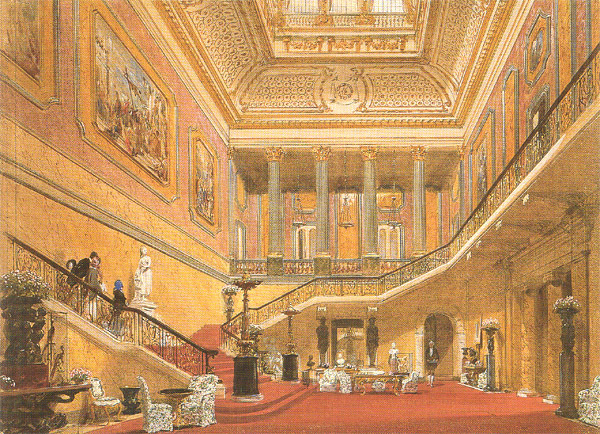 Somewhat of an extension of “Mayfair”, the district housed London’s greatest clubs, special government offices, foreign embassies, St. James’s Palace–where up until the Prince Consort’s death in 1861, the Queen held her levees and drawing rooms–and other aristocratic palaces and fashionable addresses. White’s, a Tory club famous for the bow window added in 1816, was situated 37-38 St James, just down the road from the Whiggish Brooks’. Boodle’s, directly across from Brooks’s, was at No 28. By the 1880s, these were joined by clubs devoted to all sorts of interests and backgrounds: politics, literature, arts, sciences, military units, sports, social clubs and even, for the first time, ladies’ clubs. Cleveland Row, adjacent to Pall Mall, and Carlton House Terrace parallel to the south, was the most fashionable address up until the Second World War. The latter was built by Nash to replace Carlton House in the 1830s, and each terrace consisted of nine large houses. Built without mews in order to make the best possible use of the view of the park, and also to present an attractive facade to the park, the service accommodation was placed in two stories of basements (rather than the usual one) and underneath broad terraces between the houses and the park. Lord Palmerston resided at No 5 from 1840-1846, Gladstone at 4 in 1856 and No 11 from 1857-75, while Lord Curzon lived at No 1 for twenty years. Nos 8 and 9 housed the German Embassy. Mayfair was the most aristocratic neighborhood in London and the home of Society, while society (with a little ‘s’) could be found in Kensington and Bayswater, two districts both south-east and north-east, respectively, of Kensington Gardens. Spacious mansions, every convenience, liveried footmen and so on were to be found here, and entertaining and decorating, courtesy of Whiteleys and other luxurious department stores, could be done inexpensively. 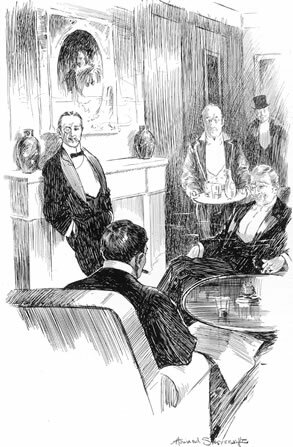 But a Mayfair residence was key to entree to the most exclusive of circles and few who had not been born into it, if any, were able to obtain it.